Did an hour on the painting last night.. just to block things in but not to get too entrenched. 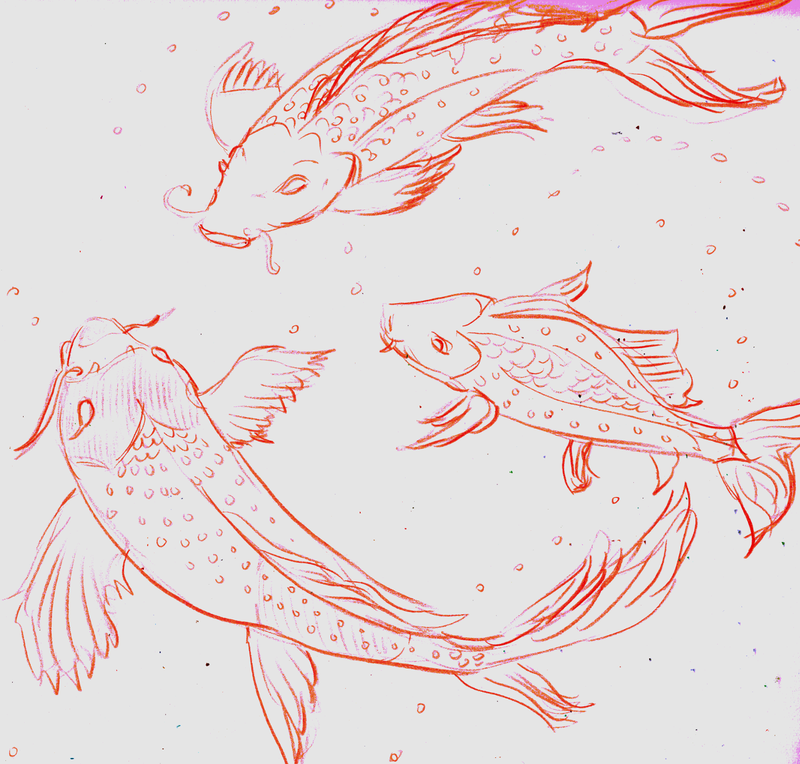 My next step might be to start the fish but also I want to take some more sketches of the plant in the middle in a light study so I can get the highlights correct. Doing laundry (sale linge) and a Welsh lesson, and making rice for my dinner tonight. We've all been getting up quite early to get used to school schedules again, which tonight I close, so it will be a long one. I've noticed my brain really doesn't feel 'active' in the same places when I am studying Welsh as studying French. The Welsh feels like a 'shorter distance' from English because of the tenses, while the French (although I know more of it) seems like I'm going through more hallways between thoughts, making more turns and 'curlicues' to get to the same places. The Welsh just feels like I'm remembering to pick up different things on the same routes most of the time, with a few oddities. Esme starts school next Tuesday. Still reading 'The Other Language' by Francesca Marciano. Some of the stories are sweet, most are tragic and leave you with a sense of 'other' but 'why' at the same time... I'm not sure why I'm still pushing on through it, because it is very different probably, and the whole reason of the book is to show how all of these people change - some slowly, some drastically (and not all for the better) when they encounter a new language that separates them from something, then joins them to something, and then many of them (but not all) play a balancing game between wins and loss, change and stability, progress and regression. I've got at least four other library books that are waiting on the queue on my Kindle.. I'm waiting on a book - Paul Auster's 'In the Country of Last Things' to come in the mail. And a CD (used buy), Seven Nations... something I used to listen on Spotify discover back when that was free. Both of these I bought with my survey-taking rewards... hoping I like the other songs on the CD... 'Under the Milky Way' is the one that earwormed back into my brain while I was working freight the other day - an echo from years ago.. a little piece on repeat - not even full lyrics, just the 'shape' of the sounds, then trying to catch that bit and 'taste' what song that was from, turning it over in my mind like pieces of a tangible wooden puzzle.. then suddenly remembering it and really wanting to turn up the volume and hear the whole thing again enveloping my eyes and skin until it reminds me why it has become a part of me. I have an hour before I need to put Esme to bed.. I've started her on the early routine again. She doesn't like it, but she isn't digging her heels in and making a terrible face as much as she did the first night. And I'm getting her up twice during the night. I think there is some anxiety about back to school happening. I didn't work much on the new painting - we did grocery shopping tonight and I didn't want to get into it when I had so much to read and I knew one dip of mixing one color to fill in one space would probably be two hours. I'm tired enough to nap now, but staying up an hour until it is 9:30. Maybe I could do a sketch... colored pencils aren't half as addictive as paint that is one more dab before it dries, one more drop before that color is gone, one more dab, etc etc.. in repetition. This is as far as I got last night- Mark said it had changed enough to need another progress picture taken... I'll get some more filled in before I work on exactly how the light needs to come across the stones to the left. And it is so hard to get pictures of this dog, Freckles.. but I caught one that wasn't a blur. She is sitting there in front of her father Spud at the top of the stairs. Had the day off, got a few things done. I've been waiting to get a better idea of what to do with this painting for a few days. I had transferred the fish drawing to it but there was all the rest of this space... did a depth sketch of a real aquarium photo in colored pencil then, with that to think on, went to the sketch on the painting and did this. I also finally finished Esme's longer pink scarf that was started probably a year ago. It took a long time, but that was the last knitting project unfinished not counting the huge afghan that has been on the needles for several years... Esme was very glad to have it done. I'm reading Miss Peregrine's Home for Peculiar Children, and waiting for In the Country of Last Things (Paul Auster) to come in the mail. I read that book so long ago and it has been sending back little tendrils that I need to finish it finally. I might take a stab at my novel again after reading it.. I have six chapters but I felt there was something big changing so I need to sweep through it again when I have actual brain time. I have a close tonight and an open tomorrow. That is never good for my brain. My sense of time is already messed up, and then put me in a short sleep cycle between two workdays and I sometimes have a thought-breakdown about four hours into the second shift. Protein helps.. but several times I've just had to take my lunch with an ice pack on my forehead and a cup of coffee and see if I can get the reaction to go away before it turns into a migraine. Not a lot else hapening... School starts on the 1st. Still no word when we will have a teacher orientation meeting... they always announce those at the very last minute and then I have to rearrange my schedule on the fly. We've been out of our air conditioning most of this week.. coping it with many ways, including popsicles and hanging out in the basement. I did a little work towards the canvas I stretched the other night. I painted it white (which wasn't all that easy, as the fabric had been a heavy blue cotton), and began to sketch out in green paint this drawing I made the other day. These are koi fish I found pictures of online. I am reading Patricia McKillip's "Wonders of the Unseen World". Many of the stories are delightful - many of them are complicated and leave rabbitholes of thought to fall down. Thinking about making banana bread here soon tonight but not wanting to heat up the only cool place myself and three dogs have taken refuge in the cement floored kitchen. The big thing about this painting is that I didn't outline everything in black. I usually get to doing that when I add so many details. I saved the black for the wrought iron and a few small places where it should be. Apple Barrel acrylics over pencil on standard sketchbook paper. It's about 14" by 9". I had a painting from 2002 that I finally put up in my kitchen, of fish swimming in a pond. It makes me happy to see it there. It took me a very long time to admit that I saw it in my mind's eye often and wanted it on full display. Tonight, I finally acted (with some nudge from Mark pointing me towards the frame I had forgotten I had) and hunted down this little cat drawing. I knew I had seen it recently, and it is another one of those that comes to mind again and again... it is joyful, and the lines are elegant. So, here it is imperfectly 'matted' with a sheet of wallpaper with a hole cut in it and some artist tape hinges behind it. It is hanging up in my sewing room where I will see it often. and she uses it more than I do. I so love the nasturtiums this year.. they haven't grown well in the past, but this year they are making up for it. I got a cucumber, a tomato, a small green pepper and some beans today - blended them all up with some mayo into a salad to eat with tortillas and cheese today at lunch. second try at one of my favorite paintings I've ever done, that is hanging in our kitchen. I had a migraine headache last night and thought I'd try the theme again to see if it relaxed me some. This painting is smaller, but has even more fish.